We are accredited with MCYS. Baby bonus can be used at our clinic. We are accredited by Ministry of Health Singapore as a day surgery facility. Atria-City Dental Group is accredited by MCYS as one of the Baby Bonus Approved dental clinics. You may use your child’s Baby Bonus card to make NETS payment for all dental treatment procedures provided you have sufficient funds under your child’s CDA. Atria-City Dental Group is accredited by the CPF Board as a Medisave Approved Clinic . Patients who are Singaporeans or Permanent Residents of Singapore may be able to claim a portion of their surgical expenses from their Medisave Account. Wisdom teeth surgery, implant surgery, bone grafting, removal of cysts, and biopsies may be claimable under Medisave. The exact amount claimable from Medisave is subject to the surgical table and the complexity of the procedure. In the event if you do not have a Medisave account or there is insufficient Medisave fund to cover the dental procedure, you may utilize the Medisave from your immediate family members such as your spouse, parents, or child. In such a case, this immediate family member would require to present his IC and be present at the clinic to sign on the Medisave claim form. Please note that the use of Medisave is also subject to the Medisave withdrawal limits. CPF Board has advised the accredited clinic to collect all dental fees upfront. We will assist patients in submitting the Medisave claims. It takes 3 weeks for the claim to be processed and approved. We will issue a cheque to the patient for the amount approved for the Medisave claim upon receipt of the payment from the CPF Board. Please note that the patient is required to come to the clinic to collect the cheque and acknowledge receipt of payment. The Community Health Assist Scheme (CHAS) is one of the Ministry of Health’s (MOH) programmes to help provide accessible and affordable medical and dental care to Singaporeans and the Pioneer Generation. Under CHAS, members receive subsidies for outpatient medical and dental treatments at participating clinics. Members will also enjoy subsidised referrals to specialist outpatient clinics when required. Atria-City Dental Group has been accredited as one of the CHAS approved dental clinics. CHAS members can now enjoy our quality dental services at our practice. Please inform us of your CHAS membership when you call us for appointment. You are also required to bring your CHAS card and IC on your dental visit and we will register the claim for you. Please visit CHAS online for list of services claimable or you may call us at 67372777 for details. Dr Bryce Lee earned his Bachelor of Dental Surgery from National University of Singapore in 1989 and as an undergraduate, he was awarded the NUS Dental Society Silver Jubilee Award in 1988 for being the best all-round dental student of that year. Upon graduation, he spent 2 years as a Dental Officer in the Singapore Armed Forces, during which time he was also Staff Officer to the Head, Dental Branch. He then worked with the Ministry of Health as a Dental Officer. While undergoing specialist training, Dr Lee was appointed as an Orthodontic Registrar at Guy’s Hospital, London and also concurrently at Kingston Hospital in Surrey, UK. He was awarded Master of Science in Orthodontics (London) in 1995 and obtained his Membership in Orthodontics in both Royal Colleges of Surgeons, England and Edinburgh, in 1996. Dr Lee is also a Fellow of the Academy of Medicine (Orthodontics) Singapore. Dr Lee is a registered dental specialist in Orthodontics and joined Atria-City Dental Group in 1996, becoming a partner in the group in 1997. Dr Lee contributes actively to the dental and orthodontic community in Singapore and internationally. 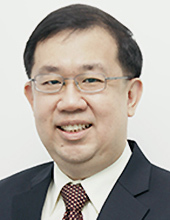 He currently chairs the Joint Committee for Dental Specialist Accreditation (JCDSA) which helps to oversee the accreditation of all dental specialists in Singapore. He also teaches part-time in the Faculty of Dentistry, NUS. Dr Lee has served as President of the Association of Orthodontists (Singapore), is presently the Secretary General of the Asian Pacific Orthodontic Society, is a Council member of the World Federation of Orthodontists and is also Vice-President of the College of Dental Surgeons in the Academy of Medicine, Singapore. Dr Lee puts in as much energy when treating his patients and has the interests of his patients as his priority when caring for them. Dr Lee keeps himself professionally updated by attending conferences and courses both locally and internationally. He is an accredited Invisalign and Clear-Aligner provider. He also practices using self-ligating and lingual braces. His interests lie in growth modification in children and in adult orthodontics. © 2019 Atria-City Dental Group Pte. Ltd. All Rights Reserved.